But in 827 BC a great revolt, centered on Nineveh, at the end of Shalmaneser’s reign forced the Assyrians to abandon their conquests in the west. After that, they were weaker for some time. The army did not go out every year to plunder anymore, and when the army did go out it was mostly just along the old route to the south. It didn’t cross the Euphrates to the west anymore. 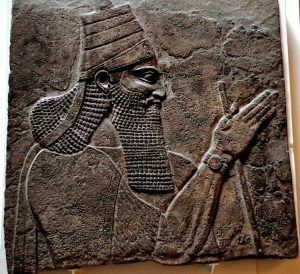 A powerful king from a new family usurped the throne of Assyria in 744 BC. His name was Tiglath-pileser III, and he was very ambitious and very strong. He began taking the army out every year again, and he took it not just along the old route, but west again, where he conquered Israel, the Phoenicians, and many other small western kingdoms. 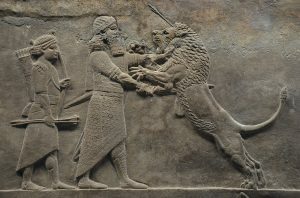 In the later part of his reign, there was another Babylonian revolt, but Tiglath-pileser succeeded in putting it down. Tiglath-Pileser’s son, Shalmaneser V, forced the Jews of Israel to move to other parts of his empire, while Assyrians colonized Israel. By the reign of Sennacherib in 705 BC, the Assyrian army again stopped going out every year on plundering campaigns. They had conquered everything near enough to rule, and even dominated Egypt. Now the Assyrian kings concentrated more on providing services to the conquered people that would keep them from wanting to revolt. The Assyrian kings now built highways and bridges and water systems, established courts to settle disputes among their subjects, and encouraged scholarship and art with great libraries at their palaces. This was the time of the great kings Esarheddon and his sons Assurbanipal (in Nineveh) and Shamash-shum-ukin (in Babylon). (the prophet Ezra refers to him as “the great and honorable Ashurbanipal” (Ezra 4:10).) But Assurbanipal and his brother got into a civil war in 652, and by the time Assurbanipal won four years later, the Assyrian empire was terribly weakened. 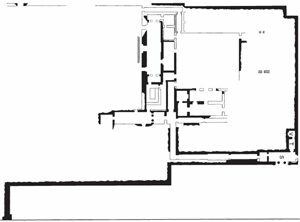 Ashurbanibal’s palace at Nineveh. Can you find the throne room? The western territories – Israel, Judah, Phoenicia, and others – began to revolt, and the Babylonian territories to the south as well. By 612 BC only Egypt remained loyal to Assyria, as a great alliance between the Jews, the Medes, and the Babylonians combined to crush the last, weak Assyrian kings. Egypt’s efforts to send help to the last stand of the Assyrians were stopped by Josiah at the battle of Megiddo in 609 BC. By 605, both Assyria and Egypt had to surrender to King Nebuchadnezzar of Babylon, and the Babylonians took over control of West Asia. The Assyrians, by Elaine Landau (1997). The Assyrians Activity Book (British Museum), by Mike Corbishley (1999). Assyrian Sculpture, by Julian Reade (1983). Things from the British Museum. Cite this page: Carr, K.E. Later Assyrians – Mesopotamia – West Asian history. Quatr.us Study Guides, September 13, 2017. Web. April 25, 2019.